Their great 4-3 win over the Tampa Bay Rays wasn't the only good thing to happen to the Red Sox in the past 24 hours. 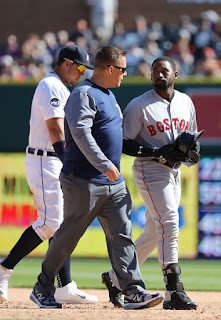 Yesterday it was announced that Center fielder Jackie Bradley Jr. is scheduled to join Triple-A Pawtucket today and start in center. Manager John Farrell told the media that the plan is for JBJ to play five innings today, nine innings Wednesday, and then rejoin the Red Sox on Friday for the start of their weekend series in Baltimore. Bradley was originally placed on the 10-day disabled list last Saturday after spraining a ligament in his right knee. He did this while rounding the bases in Detroit. Another injured player nearing a return is infielder Josh Rutledge who began the season on the 10-day disabled list with a hamstring injury. He will join Bradley on the rehab assignment, however he will need more time according to Farrell. Bradley could seriously help the Red Sox on offense since they rank last in the American league with five homers as a team. Bradley had 26 big-flys last year. On the other hand, Rutledge gives Farrell the option of a right-handed bat platoon with third basemen Pablo Sandoval, who's only hitting .132. Both players probably will not completely solve the Red Sox' offensive problems, but they will certainly help.